--Save up to $500 on any 7 night, Saturday to Saturday stay booked by April 30! See below for Winter '19/'20 offers. --Book your Holiday vacation in 2019 now with 2018 prices! You will love our large gourmet chef's kitchen while you are preparing your Holiday Feasts! We have 2 ovens so you can bake your turkey and all the sides! Or have one of our great local restaurants cater your Family Feast! Our lodge is just a short walk to Main St. and the ski lifts, but nestled in the pines overlooking our PRIVATE FISHING POND and PRIVATE BLUE RIVER FRONTAGE, this is the perfect Breckenridge vacation home. 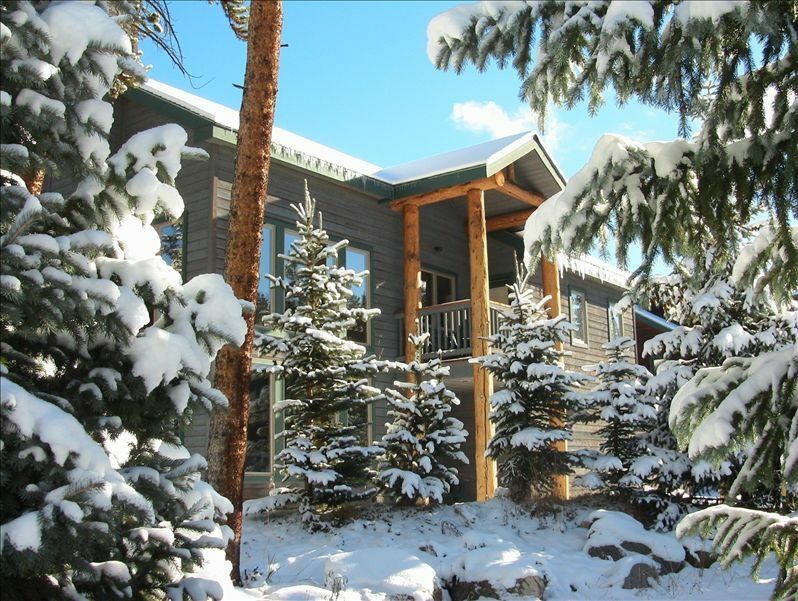 Located within Breckenridge city limits with VIEWS of TEN MILE RANGE and BALDY MOUNTAIN. Our lodge is just 2 doors down from FREE RIDE Shuttle stop (four times an hour - direct to lifts.) This LUXURY HOME has one of the BEST LOCATIONS in town at AFFORDABLE RATES. Our lodge includes everything to make your stay memorable. See why so many guests return year after year. Our location and high end finishes plus reasonable rates make our lodge a favorite. Walk on the level five minutes to Historic Main Street Breckenridge shops and restaurants. Specially designed for large groups, the Blue River Lodge is a roomy seven bedroom/five and one-half bath luxury mountain lodge home on a private, wooded lot with views of the Ten-Mile Range and Baldy Mountain, overlooking the Blue River, beaver ponds, and our own private pond in Breckenridge, Colorado. It accommodates fourteen to twenty people very comfortably. The lodge includes a gas fireplace, five large private decks, one with eight-person hot tub, another with gourmet natural gas grill and outdoor dining furniture, fully-stocked gourmet kitchen with granite countertops, tile floor and large eating/serving bar, home theater system complete with 55 inch flat screen HDTV and expanded HD cable & DVR with HBO, two-car heated garage, Two full-size washers and dryers, ping pong and foosball tables plus all of the amenities one would expect in a luxury accommodation. We have completed upgrades to the main level including hickory hardwood floors, granite countertops throughout the lodge, tile floors in the kitchen and new gas fireplace. The main floor includes a sunny, vaulted-ceiling living room with three large leather sofas surrounding a gas fireplace, a dining room with seating for fourteen, a gourmet kitchen with all new stainless steel appliances; two ovens, side-by-side refrigerator (additional side-by-side refrigerator in garage), 5-burner gas cook top, microwave, dishwasher and professional grade oversized cooking utensils. There is a generous pantry/laundry room, TV room with queen sleeper sofa, loveseat and chair, expanded cable home theatre with 55 inch flat screen HDTV/VCR/DVD/DVR, a powder room, and a large mudroom/back entry hall. Additionally, there is a small bedroom with full sized twin bunk bed, and a lavatory. A twin size rollaway is provided for additional downstairs bedding. Two separate stairways lead to the second floor with two king bedded rooms (each with en suite full bathrooms, private decks, TV/VCR/DVD, twin size rollaway and one with twin size sleeper loveseat), two twin-bedded rooms (each with en suite shower bathrooms and both can be made up as king beds, one with a large, sunny deck), and two smaller twin-bedded rooms that share a large full bathroom across the hallway. The Blue River Lodge was purpose-built as a ski chalet, with a stricter building code than a family home. There are four Master Suites, plus three more bedrooms. The rooms are very private, with fire-rated doors to each bedroom and extra soundproofing throughout the house. The location overlooks our private pond and private section of the Blue River in Trafalgar/Warrior's Mark, a short walk to the base of Peak Nine, Main Street Breckenridge restaurants and shopping, and steps away from the Breckenridge FREE RIDE shuttle stop. Enjoy skiing all of Summit County; Breckenridge, Keystone, Arapahoe Basin, and Copper Mountain. Vail and Beaver Creek are just 45 minutes away. In summer enjoy hiking, mountain biking, and rollerblading on the miles of Summit County bikeways and trails, many a short walk from our lodge. Go horseback riding, rock climbing, Gold Medal trout fishing, or golfing at the highly acclaimed Breckenridge Golf Course. Our lodge is perfect for Summer Reunions! Our large living spaces and numerous bedrooms make reconnecting easy! You can walk to town or the free Shuttle stop just 2 doors down. We have a large yard and a private fishing pond with private access to the Blue River. Learn to kayak in a heated indoor pool at the Breckenridge Recreation Center. Ice skate in the summer at the new indoor ice rink. Pack a lunch and go four wheeling to nearby ghost towns of the Rockies. Try sailing on Lake Dillon, surrounded by 14,000-foot peaks or water/jet skiing on Green Mountain Reservoir. There are over 1,000 GeoCache sites within 100 miles of Breckenridge. Or just kick back on your choice of sunny decks with a good book on a bright Colorado blue-sky day. Also, say Goodbye to the hassle of keys! Our lodge uses a secure keyless entry system making it more convenient to access the home for you and your group! Perfect for SKI VACATIONS, FAMILY REUNIONS, GOLF or FISHING OUTINGS, CORPORATE RETREATS, WEDDINGS, SCRAPBOOKING WEEKENDS, FALL LEAF VIEWING -- This home was designed for large groups. We specialize in family reunions. We are now in our 19th year of renting our home. We have done multiple remodels over the years, so our lodge is updated and perfect for your vacation! Your hosts, Hap, Margaret & Sarah Henderson, enjoying one of our favorite picnic spots just a short drive from our Blue River Lodge. For over a decade we have been hosting ski groups in winter and family reunions in summer. We enjoy skiing in the winter but summers in Breckenridge are even better. We had been renting vacation homes in various parts of Colorado each summer and when we had an opportunity to purchase our 7 bedroom Blue River Lodge as a rental property next door to our personal 'Trout House' retreat we jumped at the chance. Our lodge is an easy walk to Main Street or just hop on the shuttle two doors down. We are the only home in town with a private fishing pond in addition to private river frontage. Hiking and mountain bike trails are nearby and the lifts at Peak Nine are also close by. Views of Ten Mile Range and Baldy Mountain. Overlooking the rushing Blue River and our private fishing pond. Extra large kitchen with granite countertops, tile floor and new high end stainless steel appliances. (3) Private balconies off of three of the bedrooms. (2) Spacious dining & grilling deck on sunny side of house. Another large deck adjacent to hot tub. Golf: Or enjoy golfing at the highly acclaimed Breckenridge Golf Course. Learn to kayak in a heated indoor pool at the Breckenridge Recreation Center. Ice skate in the summer at the new indoor rink. Pack a lunch, and go four-wheeling to nearby ghost towns of the Rockies. Try sailing on Lake Dillon, surrounded by 14,000-foot peaks. Or enjoy water-skiing or jet-skiing on Green Mountain Reservoir. And there are over 1,000 GeoCache sites within 100 miles of Breckenridge. Local activities include hiking, rock climbing, spelunking, biking, golf, tennis, racquetball, basketball, geocaching, horseshoes, miniature golf, fishing, hunting, wildlife viewing, horseback riding, shopping, sightseeing, swimming, boating, sailing, water-skiing, windsurfing, parasailing, jet-skiing, rafting, downhill skiing, cross-country skiing, snowmobiling, dinner sleigh rides, dog sledding, ice skating, and rollerblading. Also close by are restaurants, live theater, cinemas, museums, and a fitness center. Ski: For a more relaxing day, just kick back on your choice of sunny decks with a good book, under the bright, Colorado blue-sky day. Sleeping Arrangements; two king-size beds, eight twins, one queen-size sleeper, one twin sleeper, one twin bunk bed, three single roll-aways.